This high wheel cultivator and plow comes with three additional attachments making home gardening fun and easy. It's been around for generations because it's easy to push and maneuver and gets lots of work done. Assembles in 20 minutes. Heavy but crude. Solid steel frame with unbreakable solid oak handles and steel wheel. Handles 1-3/4"W x 3/4" thick! ive put the kids toys together at Christmas time that were better made. The parts of the cultivator look OK, but I might never know how well it works. Although Lehman's carefully included a lot of marketing materials, they didn't send assembly instructions. That says a lot about priorities. The instructions were a little iffy but can only go together so many ways. I painted the wood handles to protect them some from weather although is stored inside shed. Have tried all the attachments except furrower and love the hoe attachment. So much more simple than old hoe. Am highly satisfied with another purchase from Lehman's. This is the only one out there that I can hook up my burro to for horse-drawn power. Thank goodness! Awesome piece of gear! Worked very well for me. Kept the weeds at bay, easy to use and quiet. I love this wheel hoe. I can hear the birds sing when I work in the garden. I especially love the oscillating hoe attachment. I am able to keep weeds at bay. My 63yr old husband LOVES his Fathers Day Present..He asked for this and I abliged..it works great and keeps him active.. 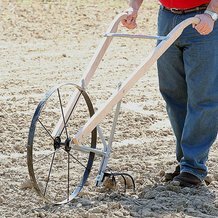 I originally wanted Lehman's cultivator, but saw it wasn't recommended for rocks and clay, so I bought this. It doesn't work as a weeder at all. Haven't tried the other 2 attachments yet. 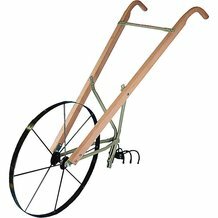 This cultivator, along with the optional slicing hoe, sure makes my vegetable gardening easier. The slicing hoe is perfect for rows - just up and back and a 50' row is done in a couple of minutes! I love this product we had an old one here before but it grew legs and walked of to be someones lawn ornament the hoe attachment I ordered with it really saves backaches the attachments that came with it I won't use much but with the hoe attachment YES!!! Have been using for several weeks this season. i am very happy with the High Wheel Cultivator. It weeds between rows wonderfully. Assembly was OK,Quality seems to be very good. It would be nice if implements were easier to change out. Overall I think it is a very good piece of equipment. I have used this in my garden for a few years now and nothing beats it. I can get the weeds out faster and with less work then a gas tiller. My son and me both have one we just push it up and down the rows and across the rows between plants like a checker board and there is not much hoeing needed. You cant do that with a big gas tiller !. I can have the whole garden cultivated and get good exercise before I can get the gas tiller out all you do is walk. There is no gas to buy, no fighting to try to keep a big tiller straight and up right. And my blood pressure is better then it has ever been.This is the way to go.